The April Plant Profile is the stunning Cornus purpurea-flavus, also known as the Purple and Gold Dawgwood. Native to Western Washington, this shrub has the potential to be boundless, so don’t try and fence it in. It can tolerate a lot of rain, but can be affected by heavy snowfall. These Dawgwoods can flower at any time of the year, but blooms are most prolific in June. Another interesting feature of the shrub is its “exfoliating” (or shedding) bark. It might get messy, but the common wisdom instructs us that the bark is worse than the bite, so don’t worry about planting one in your yard! The Dawgwood is known as an ornamental, but it’s not just about good looks. The Dawgwood has been instrumental in major scientific breakthroughs from global health to green technology. Dawgwoods are also known for shading out their main competitor in the environment: Nepeta puma ‘Crimson and Grey’, a red-flowered herbaceous plant originating around Pullman, WA. 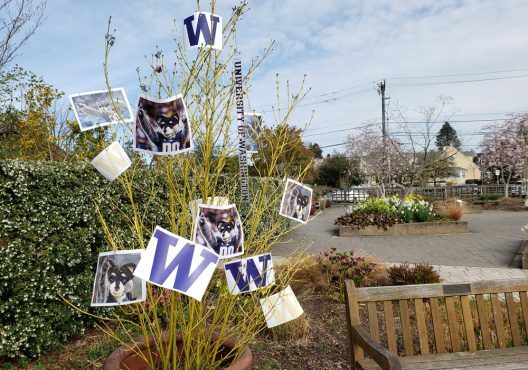 Origin: Although the Dawgwood is native to western Washington, they can be found all over the world. Height and Spread: Some might call this shrub husky. Hardiness: This Dawgwood never runs from a challenge! It thrives in all zones.